This Creamy Greek Chicken recipe is packed with flavor and perfect for eating alone, or stuffing into all of your greek favorites like chicken pitas, greek salads, gyros, and more! It has just a handful of ingredients and can be made quick and easy using your crock pot. This greek chicken gets it’s signature flavor from the combination of the greek seasonings and fresh lemon juice. The creaminess is the bonus that makes it just a hint rich and brings all of the flavors together. As a bonus, this recipe is not only delicious, but also gluten free and perfect for low carb diets! My love affair with Greek food started in the food court of our local mall when I was about 13 years old. The power of being dropped off at the mall with friends and have the ability to pick whatever I wanted from the whole food court was almost more than my 13 year old self could handle. Somehow I passed up the pizza and my beloved Chick-fil-a and landed at a Greek restaurant. That was the first time I tasted Greek food, and I still remember the Greek Chicken salad and pita that I got and split with my friend. We would repeat that meal roughly 200 times over the next 8 years, and quite a few more than 8 years later I am still in love with Greek food, but have moved from the food court to making it at home. You can serve it with one of these options, or mix and match and pick a few! If you have a favorite serving idea that I missed, please leave me a note in the comments so I can give it a try too! This recipe only has a handful of ingredients so it is definitely quick and easy. I am going to walk through a few tricks and answer some questions here for you in case there are any that pop up while you are cooking. If you have any others just make sure to leave them for me in the comments. The full, printable recipe card is at the bottom of this post! 2 lbs boneless, skinless chicken breast– This will be about 3-4 average sized chicken breasts. I just trim off any fat or gristle to get them prepped up. 1/4 cup fresh lemon juice- This is roughly the juice from one large lemon. You don’t have to be super exact if you are just a little over or under with one lemon. Using fresh juice will make a big difference though so I do recommend it. 1 tbsp greek seasoning- When I make this I generally use my homemade greek seasoning. It is delicious, and also has the benefit of being gluten free, dairy free, and low carb friendly. If you prefer the ease of buying it premade, I recommend Cavenders Greek Seasoning. It is really tasty and will give you a great result too. 8 oz cream cheese, softened- I use original Philadelphia, but you can also sub low fat, or neufchatel cheese here. Avoid fat free cream cheese since it doesn’t melt the same so it won’t give you that smooth creamy end result you are looking for. Q: Can I freeze this Creamy Greek Chicken recipe? A: Yes! You can freeze this recipe either before or after cooking. To freeze before cooking place the chicken breast, lemon juice and seasoning in a freezer bag and. freeze leaving the cream cheese separate. Q: Can I cook this for longer than 2.5 hours or on low? A: Chicken tastes best in the crock pot when cooked for around 2-3 hours on high or 3-4 hours on low. You can continue to cook the chicken without burning it, however the texture will be altered and in my opinion, it is not nearly as good as if you can prepare it for the suggested time. Q: Can I use this recipe for meal prep? A: Yes! This makes a great meal prep menu. You can pair the prepared greek chicken with cucumber tomato salad, pita bread, roasted vegetables, or grains. Q: Is this Greek Chicken Gluten Free? A: Yes when you use the homemade greek seasoning it is! 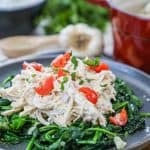 Q: Is this Creamy Greek Chicken low carb? A: Yes it has only approximately 2 grams of carbs per serving. This is calculated only for the greek chicken, so you will need to add in any additional nutrition info for what you choose to serve it with. Q: Can I double or triple this recipe? A: Yes you absolutely can! You may need to increase the cooking time depending on how full your crock pot is. Greek Chicken wraps- Use flatbread and layer hummus, tzatziki, greek chicken, lettuce, tomato, onions, peppers, cucumbers and feta, then roll it up and eat! Greek Chicken quesadillas- Layer this greek chicken with a little feta and fresh spinach between two tortillas and grill it up! Hopefully this will have you just in love with this simple Creamy Greek Chicken as I am! 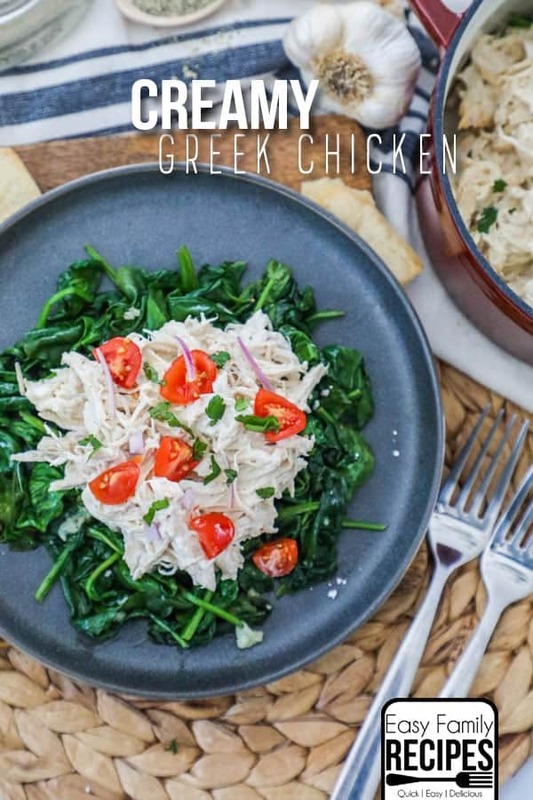 This Creamy Greek Chicken recipe is perfect for eating alone, or stuffing into your greek favorites like pitas, salads, gyros, and more! This recipe is filled with flavor and made quick and easy using just a few ingredients and a crock pot!